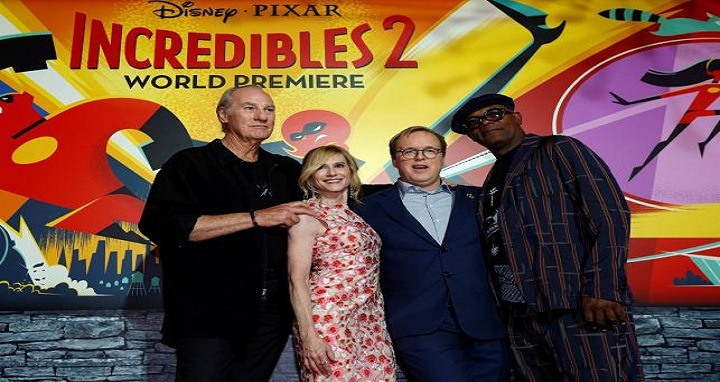 Dhaka, 13 June, Abnews: After a glut of lucrative box office juggernauts from its Marvel Cinematic Universe, Disney is looking to break more records with “Incredibles 2,” the long-awaited return of a quirky animated superhero family. The film which comes out Friday, a full 14 years after “The Incredibles” looks to score the highest debut ever for an animated film at the North American box office. Experts are predicting a $140 million-plus opening weekend for Brad Bird’s sequel to his own hugely popular original, which would surpass the $135 million debut of its Disney-Pixar stable-mate, “Finding Dory” (2016). “For a very long time, people have been wanting this film,” Samuel L Jackson, who returns as superhero Frozone, told reporters at last week’s glittering premiere in Hollywood. In the latest adventure, Parr family matriarch Helen (Holly Hunter) is called upon to help bring the world’s hiding superheroes back into the open, while husband Bob (Craig T Nelson) navigates the day-to-day heroics of being a homemaker. Their children Violet (Sarah Vowell) and Dash (Huck Milner) are back again, along with baby Jack-Jack, whose devastating super powers are about to be unleashed. It all goes a bit awry-as it always does-when a new villain emerges with a brilliant and dangerous plot that threatens the world. “It’s kind of like a spy movie-ultra, uber-sophisticated, kind of 1960s, free-wheeling,” Hunter told a question-and-answer forum at the AMC Century City movie theatre in Los Angeles. There may be a 14-year gap, but the sequel starts about five seconds after the original ended, with the Parr family donning their superhero masks, ready to face the new threat. “We left people wanting more at the end of the last film... There was this villain, everyone wanted to see what the outcome was with that fight,” said producer Nicole Grindle. Chris Hayner, the associate editor of GameSpot, enthused that the sequel “improves on practically everything” from the original. “Its visual style is stunning to look at, the characters are fantastic, and the adventure is a blast,” he added. Released in 2004, “The Incredibles” won the Oscar for best animated feature and grossed $633 million worldwide, posting one of the largest openings in history for an animated feature. “The superhero part is secondary to the roles you play within a family,” said Bird, summing up the appeal of the Parrs.